Mornings in Jenin tells the history of Palestine through the eyes of four generations of Palestinians. It begins prior to the creation of Israel and the expulsion of Palestinians from their land, and goes through the siege on the refugee camp in Jenin in 2002. It’s a side of history not very often told, as most reports heard in the Western world are told from the Israeli point of view. This story was a very personal one for me because my sister lives in Jenin, which is on the West Bank, and is married to a Palestinian refugee. Two years ago, I traveled there for her wedding and stayed with her a little over a week. In that time, I saw Tel Aviv, Jenin, Ramallah, Jerusalem, and Bethlehem. Before I went over, I knew very little about the Israeli/Palestinian conflict. I read some nonfiction books before I went, trying to get a sense of the conflict. I knew my sister’s opinions, but I wanted to form my own based on my own knowledge and experiences. Let me say up front that I am not anti-Jew, nor do I hold a grudge against the Jewish people in Israel. On the other hand, I despise the Israeli government and military and I think what they have done to the Palestinians over the last 60+ years is unforgivable. In America, we don’t get to hear the Palestinian side to the story. All we hear is that the Palestinians are terrorists preying on the poor, innocent Israelis. Nothing could be further from the truth. In that part of the world, I saw the contrast between the super-rich, Westernized world of Israel and the third-world, sewage-ridden, completely downtrodden Palestine. When we crossed the checkpoint from one world to the next, there was instant change. Roads became potholed, packed-dirt lanes. Electricity worked some of the time, and only in some places. There were places with no sewage treatment or reliable running water. The refugee houses were concrete blocks with square holes for windows and a hole in the floor for a toilet. Men and women with gigantic guns set up checkpoints in random places to harass people trying to travel within the West Bank, supposedly to “catch terrorists” but more just because they can. I heard stories of “administrative detention,” where Palestinians are grabbed at random and put in jail for six months with no charge or no trial. I heard about the way people are tortured, the way people I met had been tortured. Without reason. Just because. I saw the way the Israelis treated the Palestinians, and forming my opinion was not difficult: this is wrong. No, I don’t agree with the Palestinians who become suicide bombers or who shoot rockets into Israel. I don’t condone violence in any fashion. But compared to what the Israelis do to the Palestinians, stuff I can’t even talk about because it makes me violently ill, the Palestinian “terrorists” are petty criminals. The Israelis are the real terrorists. Again, not all. I’m not saying every Israeli is like this. Of course not. But the government and the way they run their military is not at all humane. They have taken everything from the Palestinians, denied them every right, and squished them into little plots of land. While I don’t agree with the way the Palestinians have fought back, I can understand them fighting. If someone did to my family what they do to Palestinian families, I’d fight back as well. 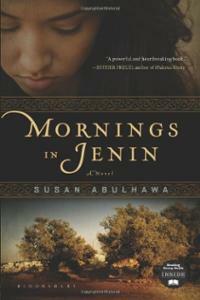 Mornings in Jenin goes into details about some of the things that families have to live with. Things that to sheltered Americans may sound like exaggerations, but aren’t. They aren’t. I’ve heard too many firsthand accounts of these exact things. In 2008, I read a book written by the children of the Jenin refugee camp. My brother-in-law helped to translate the Arabic to English for this book. The children wrote essays, fiction, poetry, and photo journals for the book. Some of the kids were real young, 7 or 8 years old, and some were older in their teens. One of the things they wrote about was the siege on the refugee camp in 2002, which is discussed in detail in Mornings in Jenin. My brother-in-law’s neice wrote about how her family survived because their house was locked in the middle of others where bulldozers couldn’t get to it and no bombs happened to hit it, though one fell nearby and the explosion shattered her eardrum and caused her to go unconscious for some time. Another child wrote a tribute to one of her friends, a ten-year-old girl who had been playing with a doll near a window and who was shot and killed by an Israeli sniper. Death, war, and violence are a constant part of these children’s lives. Grief, loss, pain, and fear. I was twenty years old and they gave me total power over other human beings. He did some evil things, but he was not evil. He was good to me. Yes. These two statements are exactly right. People, Jewish or Palestinian, are not evil, even as they both do evil acts at times. I like the understanding that is inherent in that second statement. And in the first as well. Just like in any other situation, when you give people complete power over other human beings, the inevitable result is the inhumane treatment of those people. Even the Stanford Prison Experiment showed that. And total power is what these kids are given when they join the military in Israel. Complete power over the Palestinians, coupled with the prejudice they are raised with. It’s no wonder they hate the Palestinians and treat them the way they do, the way it’s no wonder Palestinians hate the Israelis and fight back. It’s a vicious cycle, and honestly I’m not smart enough to know how to get it to end. Mornings in Jenin addresses so much. It not only tells the history of Palestine, but it talks about a culture we know very little about here and have definite misconceptions about. It talks about mother-daughter bonds and the value of family. It talks about discrimination against Muslims in the United States. In some ways, I think Abulhawa tackled almost too much in this book, but I’m glad she did. It was beautiful and moving. The book is not without flaws, though. Content-wise, I think she’s spot-on, with one exception (more in a minute). While it may sound like an exaggeration to our naive ears, the things she says in here are based on fact. They are things everyone should know about. I wish everyone would read this book and learn what is hidden from our newspapers. Did anyone even hear about the massacre that took place in Jenin in 2002? I know I didn’t. I never even heard of the city until my sister moved there in 2007. Structurally, though, the book suffers from a few problems. There is a fairly steady change in point of view at random intervals throughout the book. Sometimes it’s third person, sometimes it’s first person from Amal’s POV, sometimes first person from Yousef’s POV. Each time a new section started with a new POV, I was really disoriented for a minute. It’s a shame, because if the book had stuck to one viewpoint, it would have been far more powerful. Abulhawa does an excellent job of making the reader experience the world around the characters even in third person form. I know first person is used to be more powerful, but in this case it ends up detracting from the text. I know this is a huge review, and I left so much out, too! The Palestinian/Israeli conflict is very personal to me because I have family there, but I do want to say that it’s my personal experiences, not my bias based on family, that formed my opinions on the situation. I’ll repeat that I am not anti-Jew. I don’t care one bit if someone’s Jewish, Muslim, Hindu, Christian, atheist, whatever. I don’t care about a person’s ethnicity or their religion. The only thing I care about is the way people treat others, and in my experience, the way the Israeli government and military treat Palestinians is criminally wrong. I’m glad to have come across a book that shows exactly why I feel the way I feel. This entry was posted in 2010, Adult, Prose and tagged divinity, Middle East, POC. Bookmark the permalink.